How important is marketing to a business? Many experts would argue that a good marketing strategy is just as valuable as offering a great product or service. In fact, without effective marketing, most businesses are doomed to fail. The main goal of marketing is to connect with customers and potential customers in meaningful ways. After all, unless someone knows that you exist, how can they possibly buy your product? Accordingly, it’s important to reach out to your market niche in ways that make your product or service impossible to ignore. Traditional marketing accomplished this task in several ways. Not so long ago, the majority of the U.S. population picked up a newspaper on a daily basis. This made print advertising a veritable gold mine for many businesses. Similarly, companies found marketing success by mailing flyers and promotional materials. Others purchased airtime on local radio and television stations. Through one or more of these traditional marketing channels, businesses found a way to connect with their audience. While all of these traditional marketing channels still exist, they are not necessarily the gold mines that they once were. Most people get their news digitally these days, and they much prefer email to snail mail. Moreover, the proliferation of satellite and web-based radio stations as well as television streaming services means that fewer people are listening and watching the same channels even in a relatively small geographic area. As the digital world becomes increasingly pervasive in the real world, digital marketing has become fundamental to business success. What is this phenomenon, and what do you need to know about it? 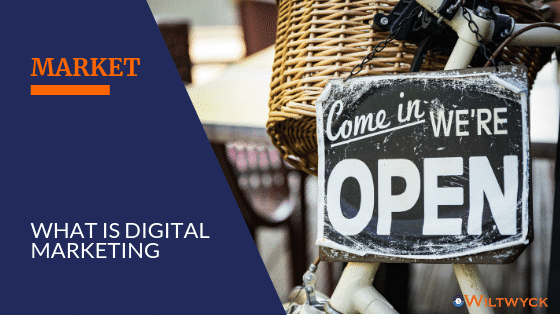 Digital marketing is simply getting the word out about your business in the digital world. This may involve websites, email, apps, social media and more. Estimates suggest that more than half of the people on Earth use the Internet on a regular basis. This means that the majority of the world is spending time every day on the Internet. They access it through PCs, laptops, tablets and smartphones with the upshot being that your business has to be prepared to reach people through all of these means. Marketing in the digital space is more than having a responsive, easy-to-use website. It involves a combination of coordinated efforts that all add up to an effective marketing strategy. Let’s take a look at some of the most vital forms of marketing in the digital world. The company website is the end-all and be-all for most businesses. Most marketing efforts are directed toward driving customers to the website where they can buy products or schedule services. Accordingly, it’s imperative that the website looks great and works even better. Without a fast, responsive website, most customers will simply get frustrated and start looking elsewhere, usually on the website of your competition. To that end, it makes sense to ensure that your web site’s design is simple and fresh. The last thing you want is to confuse your customers with a flashy design that’s difficult to navigate. Also, take into account that people may be looking at your website on a PC, tablet, laptop or smartphone. This means that you may need several versions of your website, each one optimized for how it’s being viewed. Load times are almost as critical as the quality of your content, which we’ll talk more about later. Websites with slow load times frustrate customers, making it sensible to regularly audit performance for metrics like website speed and load times. It’s also vital that your website properly showcases your products or services. Photos, videos and well-written text descriptions can all enhance customer experience and tout the features and benefits of whatever you’re selling. Search Engine Optimization, or SEO, is the process through which you can ensure that your website achieves a higher rank on search engine results pages, or SERPs. This is accomplished mainly through two forms of SEO: on-page SEO and off-page SEO. On-page SEO essentially involves optimizing each page on your website so that it ranks as “more relevant” in search engines. The HTML source code and the actual content on each webpage may be optimized by choosing the right title tag, adding modifiers to your title, choosing the right H1 and H2 tags and being smart about where you put your keyword. All of these efforts are incredibly helpful for getting your company website to figure higher in SERPs, but they aren’t necessarily marketing. That’s where off-page SEO comes in. These marketing efforts rely on links, relationships and great content to succeed. Consider it this way: Your website is your home, and you’d like to encourage people to visit you there. However, unless you extend the invitation and put the word out, most people are never going to know where your house is. By doing guest posts, sending out press releases and seeking citations, you’ll be casting a wide net that draws others to your house. Many websites make use of “guest posts”. Essentially, this means that someone has invited an expert from the same or a related industry to create a blog post for their website. Somewhere in the guest post, the writer mentions their website or their business with a link to take you to their home page. People who read the guest post often visit the website as a result. In a nutshell, this is off-page SEO. Utilizing a press release distribution service is just another channel for off-page SEO. Any events or innovations involving your company are written up and given to the distribution service. Your press release, complete with backlinks to your website, is then distributed to millions of recipients, hopefully driving increased traffic to your website. Citations and Local Search Engine Optimization represent even more off-page SEO strategies. Basically, citations are found on social platforms, local business directories and websites. Google My Business, Infogroup and Acxiom are just a few of the local business data platforms that you’ll want to explore. The citation may be as simple as a name, address and phone number, but also may include information like a link to the website, hours of operation, reviews and links to social media. Additional off-page SEO efforts also may make sense, depending upon the company’s industry and their goals. Sometimes referred to as pay-per-click or PPC advertising, paid search is basically the “sponsored results” that often show up at the top of SERPs. These sponsored results are directly relevant to the keywords entered by the search engine user, which is why paid search marketing is often so effective. When people see a sponsored search, they know it’s related to whatever they’re looking for, and that leads to more clicks. Google Adwords is perhaps the best-known platform for PPC advertising. The beauty of PPC is that it reaches a certain audience, one that consists of individuals who are specifically searching for whatever you are selling. Whenever a user clicks on your PPC ad, you pay a small fee. Hopefully, you’ll also get a sale, making the expense absolutely worthwhile. PPC advertising isn’t necessarily as easy as it sounds. Typically, a great deal of research goes into deciding which keywords and keyword phrases should be targeted, and it’s vital for the ads to be compelling and informative. With online shopping increasingly being the method chosen for purchasing goods and services, you can’t afford to not have your company at the top of the search results. Numbers from Pew Research suggest that a majority of Americans use some form of social media. While Facebook and YouTube dominate the landscape, other popular platforms include Twitter, Instagram and LinkedIn. If a company isn’t on social media today, then they are missing out on valuable opportunities to interact and connect with customers. In increasing numbers, people turn to their social media network when looking for advice and guidance. They ask friends on social media which brands and companies they trust, and they often go to social media first when looking for reliable reviews. Peers share their experiences, often with extreme passion and verve. Accordingly, it is exceedingly important for companies to make their social media footprint felt. Perhaps the best way that any company can leverage their social media presence is with education. Ultimately, the social media posts that a company puts out should inform the public about their product or service while also demonstrating what differentiates them from the competition. To truly succeed, it is vital that you tailor the content of each post to the particular platform where it will be published. For example, YouTube thrives on videos while Instagram users are drawn by great photos. Blog content may make you a master on LinkedIn. The point is that it’s not enough to blast the same content on every platform. When you make individualized efforts to really leverage the strengths of each social media platform, then you’re on the path to success. Fully leveraging the power of social media is a great deal of work, but there are other ways that you can make the most of your presence there. Platforms such as Facebook, LinkedIn, Twitter and Instagram all offer paid advertisements. These are an interesting approach as they are relatively passive in nature. Essentially, when paid ads appear on social media, it is because the user fits a specific demographic or is known to have particular interests. They are not necessarily actively seeking to buy a product or service at the time they see the ad. Nonetheless, it may catch their eye and lead to a click that takes them to your website. The better your paid social media ad is, the more likely it is to convert casual browsers into buyers, and there is certainly an art to the process. Not only do you have to decide which social media platforms you’ll pay for advertising on, but also you’ll have to figure out a budget and find ways to track your return on investment. Paid social media ads can yield big results, but only if they are managed intelligently. Content frequently is what differentiates a great website from one that is simply good. It’s got to be detailed and informative, imparting valuable facts to customers in an engaging fashion. The quality of the content on the pages of your website not only makes you rate higher in search engine results but also provides a valuable service to your customer. Basically, your website is selling your business to the public before you have direct contact with them. One of the most valuable types of content marketing is the blog. People love to read a well-written and informative blog post. A great blog post improves your website’s SEO and drives organic traffic right to your site. Video content is quickly becoming just as important as blogs. This is because visuals grab the attention of even the most casual browser. Plus, videos keep people on your website longer, which translates to more sales. People also love bright, informative infographics. Visual content marketing like infographics helps customers to quickly put things in perspective and understand what your business can do for them. Another illustrative kind of content marketing is the case study. Ask a few of your best customers to tell their stories about how you have improved their lives or solved a problem for them. Potential clients may begin to see themselves in your satisfied customers. Other effective types of content marketing include checklists, whitepapers, interviews and eBooks. Using some or all of these content marketing strategies makes your website interesting, informative and a pleasure to view. Email has been around for more than two decades now, and in many ways, it remains the most successful among marketing efforts in the digital realm. Accordingly, it’s vital to collect email addresses from customers and potential customers. Achieving a balance between getting the word out about your product or service and not flooding the inboxes of your customers is critical. The reality is that no one likes to be inundated with too many emails, which may lead to them requesting to be unsubscribed from your list. However, when emails are informative, eye-catching and attention-getting, you’re bound to see results. Make your emails reader-friendly and quick to get to the point. The sensible and effective use of graphics, images and videos may be what separates your emails from the competition. When your emails inspire and inform, then they are bound to get a reaction from customers. Marketing can be an enormously time-consuming process, and after all, it’s not as if you’re in business just for the sake of advertising. You have an important product or service to sell. This is why automation is such a critical factor in your marketing efforts. Over time, you’ll discover that much of what you do for marketing is repeatable, so why not set up your systems to do just that? Many software solutions are available that help you automate much of your marketing activity. Emails, social media posts and certain website updates can all be automated, saving you time and money. What’s more, this technology makes it easier to measure marketing tasks so that you can improve efficiency and generate revenue faster. A marketing automation system may involve a central marketing database where all of the company’s marketing data is stored. Your database will help you to target just the right message to each customer. The automation system likely also will include an engagement marketing engine that provides a place to create and manage marketing processes across all channels. Additionally, the system requires an analytics engine so that you can test and measure the performance of your marketing efforts. This is an essential component as it allows you to easily see which of your efforts are paying off and which could use some improvement. Businesses both large and small may benefit from marketing automation. In fact, small and mid-size businesses are increasingly using this technology to free up their time and resources for focusing on other things. Automation also works across all industries. Whether your customers are other businesses or consumers, you can communicate more effectively with them when you automate at least some of your marketing efforts. A cohesive, consistent marketing campaign can get your company noticed. In fact, it’s possible to coordinate a digital marketing campaign with more traditional channels like radio, print advertising and direct mail. Integrating these efforts across all possible marketing channels requires a great deal of effort, and it is not necessarily inexpensive. However, if you keep track of metrics like return on investment, you’re likely to find that your marketing efforts are paying off. If you’d like to know even more about marketing in the digital realm and how these marketing channels can set you above the competition, then schedule an appointment with Wiltwyck. We’re happy to help you explore the possibilities that could have you interacting with customers and getting the word out about your products and services to a growing audience.